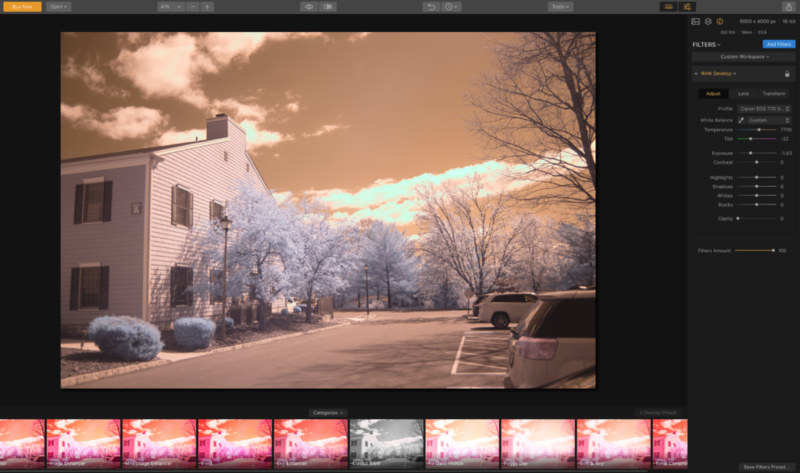 The final hurdle to mastering infrared photography is post-processing. Once you figure out how to set custom a white balance for each different infrared filter, the properties of infrared light, and how to best compose your infrared shots with your specific camera model, there is still the business of editing those raw, out-of-camera infrared files into a finished product worthy of your infrared photography gallery. 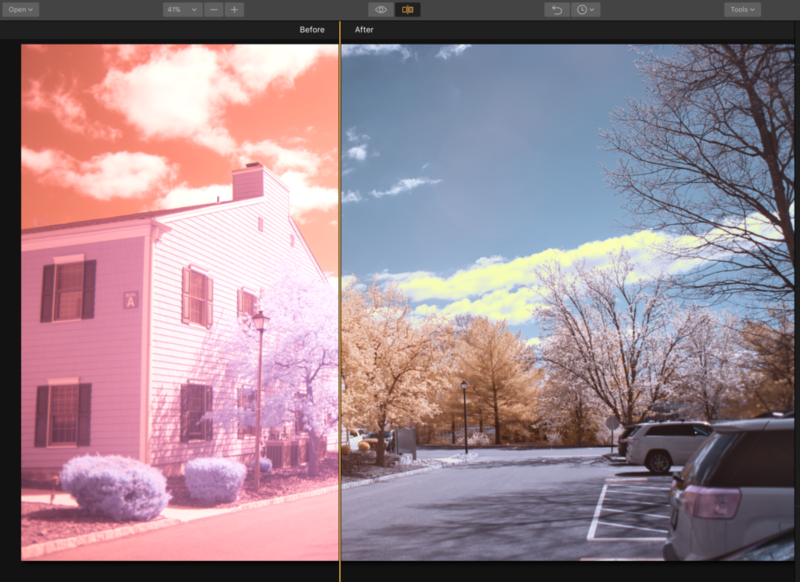 We’ve shown you how to channel swap your infrared color images, and we’ve shown you how to make a custom DNG profile for those more stubborn cameras that refuse to set a white balance in infrared. With those skills down, you have everything you need to master infrared photography. But, there is no denying that these processes lead to a very cluttered workflow, especially for those of us who prefer a more streamlined photo editing software like Lightroom. Jumping between several different programs to process infrared RAWs, or even to simply channel swap an infrared JPEG can get tiring after a while. Here at Kolari Vision, Luminar is fast becoming our favorite infrared photography editing software. It first came to our attention as “Lightroom with a channel swap function”, which was significant on its own. 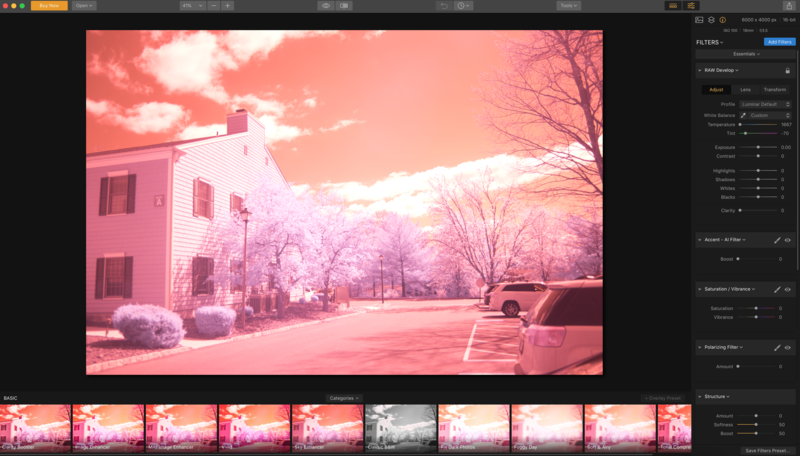 But, with recent updates to speed, batch processing, and Adobe DNG profile support added for Mac and Windows, Luminar could be your one-stop infrared photography editing program. Along with its practical layout and user-friendliness, you can have it for one time payment of $69, or $59 when you use our $10 off coupon code KOLARI. No subscription required. 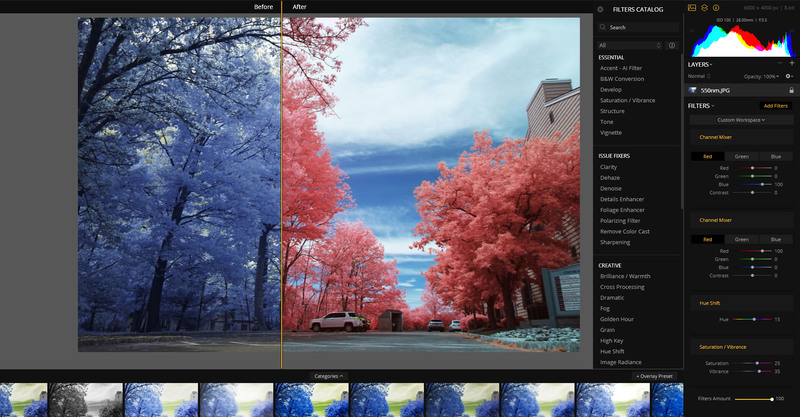 If you were looking for an alternative to Adobe software, especially for infrared photography, we can’t recommend Luminar enough. First you’ll import your RAW, out-of-camera image. We’ll start with an early Spring photo taken outside of the Kolari Vision office. Even if you set a proper white balance in camera,when you’re bringing your RAW into Luminar, Adobe, or another RAW processing software, you may be met with this all too familiar shade of pink. It can be discouraging, as your carefully determined WB settings have apparently all been ignored by the program. 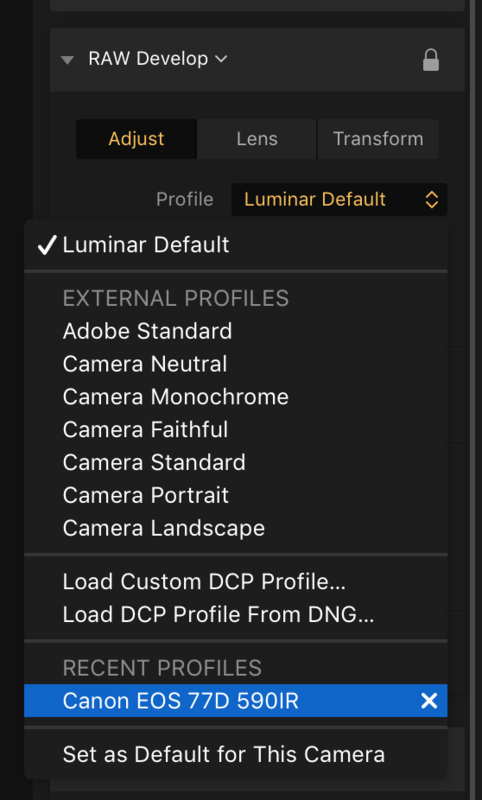 Luckily, Luminar now offers DNG profile compatibility, so you can use the same custom DNG profiles you use to save your RAWs in Adobe software with Luminar. Select profiles, and if you don’t see yours there already you can load them in straight from the drop down menu by selecting ‘Load Custom DCP’. Intuitive. Here, I’ll select a custom DNG profile that I’ve already made for the Canon 77D with a 590nm conversion using this tutorial. Once the custom profile is applied, we’re met with this. Definitely far from ideal, but remember, applying a custom DNG profile is not supposed to be a quick fix. 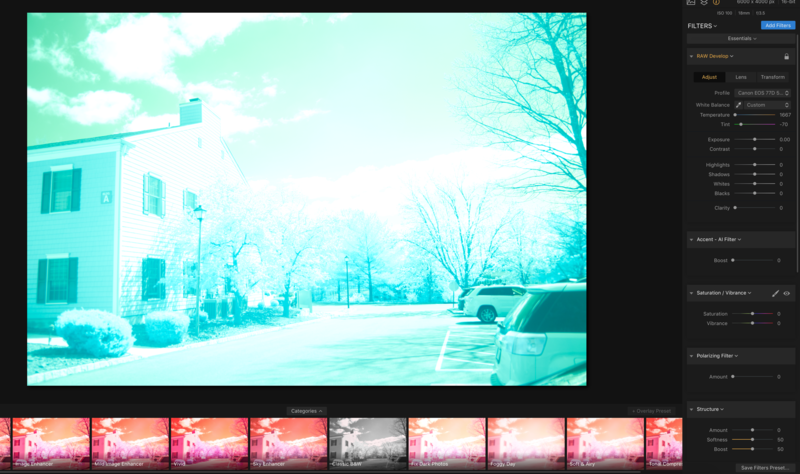 The key here is to make the photo editable, which it is now as opposed to when it was an incurable pink mess. Now that we can actually edit the photo properly, a few exposure and white balance adjustments later we end up with this: something much closer to what you probably saw on the back LCD of your camera before the software undid your white balance settings. 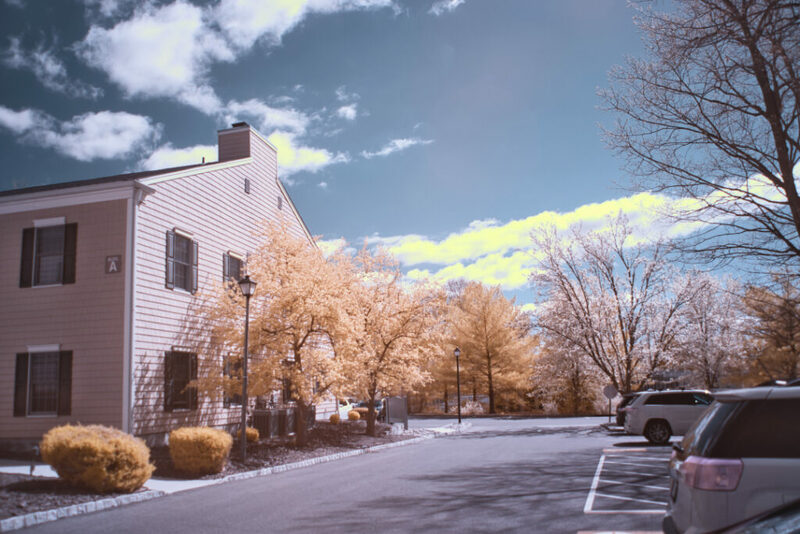 Now we have the proper color balance of a JPEG, but we’re still working with RAW, so we’ve retained the full editing capability and image quality of our camera in infrared with zero compromises. So far, we’ve equaled the convenience and IR editing ability of Photoshop and Lightroom, but we’re about to surpass it. If you’re anything like us, you probably love the convenient and intuitive editing interface of Lightroom. It would be perfect for infrared photography if only we could perform a channel swap. 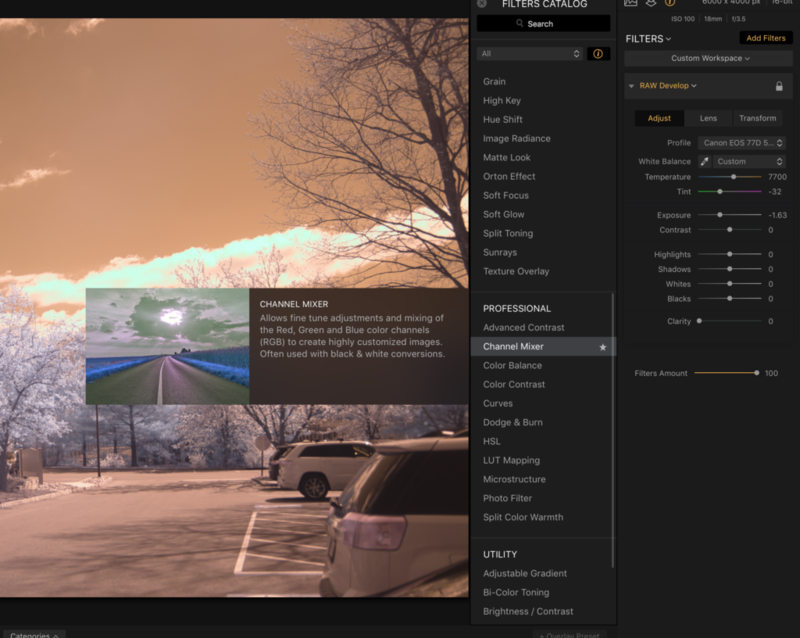 In Luminar, it’s that simple. 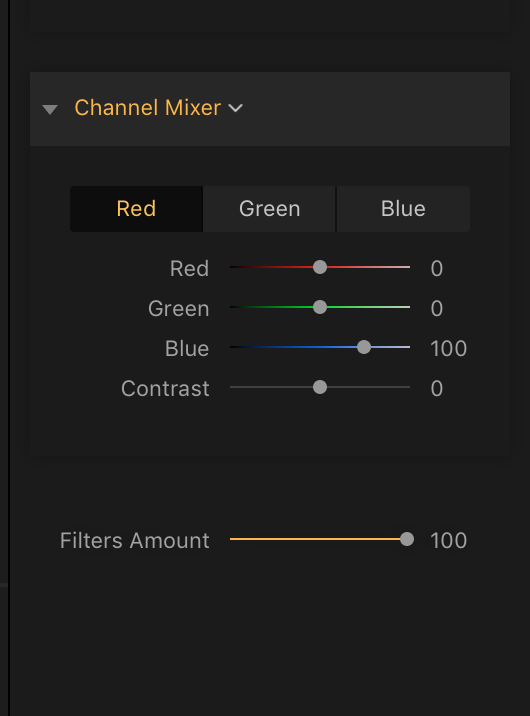 Select ‘Add Filters’, scroll down to ‘Professional’ (of course), and select ‘Channel Mixer’. This will add the color channel tool window below the standard ‘RAW develop’ sliders. 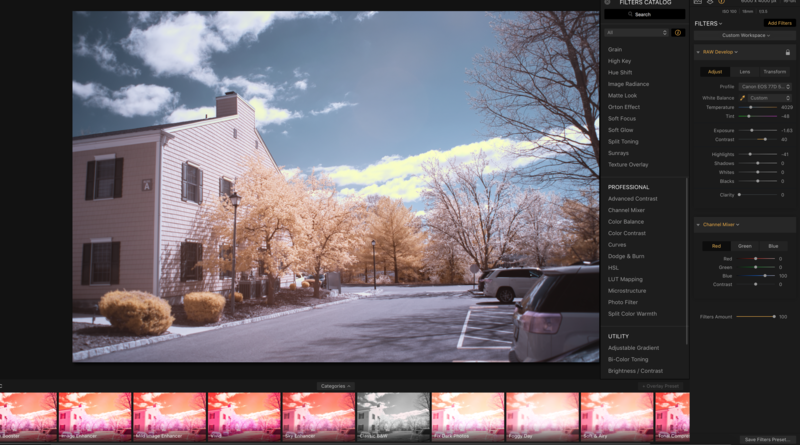 You’ll find that you can use every one of Luminar’s editing tools in this highly customizable way and even save preset slider arrangements to optimize your workflow for your style of editing, and it can’t be beat for infrared photography. 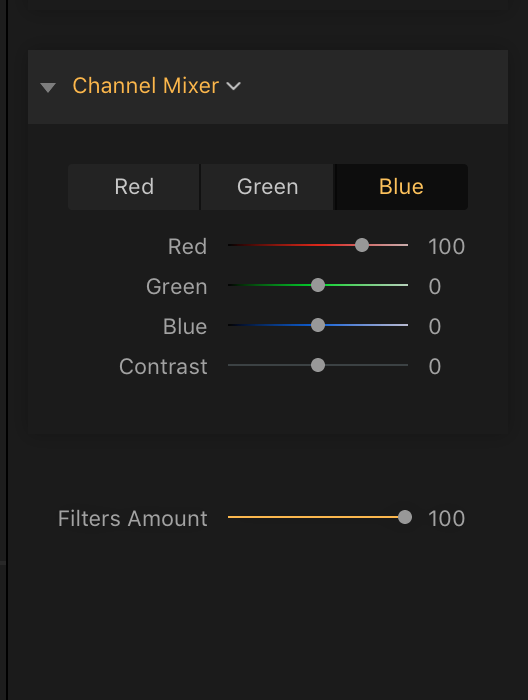 Next, we’ll use our newly added channel mixer tool to perform a standard red/blue channel swap. First, set red to ‘0’ and blue to ‘100’ in the red channel. Then, do the opposite in the blue channel, and set red to ‘100’ and blue to ‘0’. Finally, we arrive here, at the warm bright foliage and blue skies the 590nm filter is known for. You should be able to get even better results than I did here now that it’s summertime. And, like any good cooking show, here is our finished product. Profile corrected, channel swapped, and still offering the full range of editing freedom that you get with a RAW file. Thank you for the article, but I’m a mite confused. If I add the filter “Raw Develop” – I don’t get any drop down under Profile, as you describe. Am I looking in the wrong place, or need to check some box or other. I’m using the latest Luminar 2018 PC version and it’s up to date. Luminar impressed us by allowing us to red-blue channel swap IR jpeg images, something we were unable to do with either Photoshop or Lightroom. Once we determined that significant advantage, we knew we could get our relative who likes landscape photography but dislikes computers into painless load/channel-swap/export-name IR photography with a pocketable zoom camera. Kolari was very helpful, answering all our questions, and we decided on their Panasonic sz7 720nm camera. When it arrived, we liked it so much we got an sz7 but with full spectrum conversion for ourselves, plus had Kolari convert a Cannon S3 to full spectrum. The cameras will share filters. and we can add more later on. We also got Luminar for ourselves, which I am enjoying it more than our Adobe products.